I have been a fan of NetNewsWire on the Mac for some time now. I have used that software tool to catch up with my favourite news feeds when I have the time to sit down with the laptop. More often than not I catch up with the news feeds using NetNewsWire on the iPhone just before I go to sleep or Reeder on the iPad when sitting in front of the flat screen idiot box. Reeder on the iPad is an excellent news reader. It is clean, uncluttered and uncomplicated. I like it. Recommended. It is not free unfortunately. $USD4.99. I think the cost is worth it. Reading news feeds is a keen past time of mine. 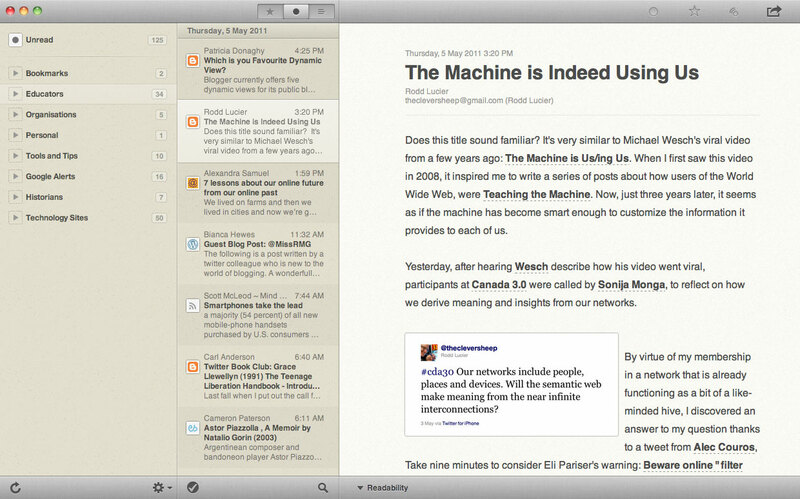 Well, for some time now I have also been using Reeder on my Mac laptop. It is also clean, uncluttered and uncomplicated. It is rather elegant in fact. This is one of the great examples where a tool devised for iOS has translated across to OS X rather beautifully. It is a nice application. User friendly. As simple as that. Let’s have a closer look. Look at the main window. Clean, elegant, understated. The sidebar provides an elegant view of the various news feeds and a preview of each story to the right. It allows you to intelligently decide which feed items to read and which to ignore. This is useful for me as I subscribe to a number of Google alerts as well as feeds for sites such as ReadWriteWeb and The Unofficial Apple Web Log. I cannot possibly read everything they publish. 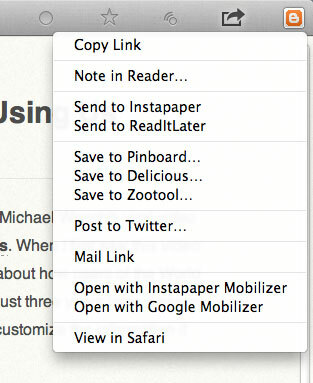 Reeder also affords the user to ability to share particular news items in a multitude of ways. Check the list below from the drop down Share menu icon. Instapaper, Twitter, Delicious just to name a few. I have never even heard of ZooTool. 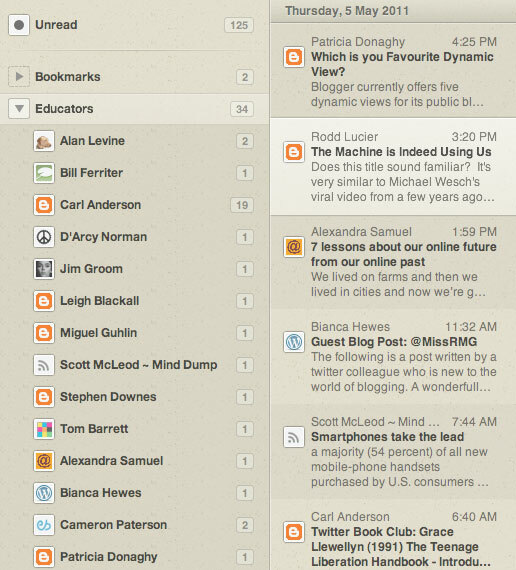 Sharing via Reeder is a great feature. Of course one can mark and view either starred, shared and simply unread items by selecting the relevant icons. 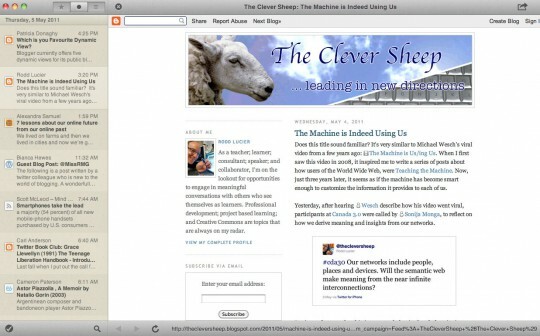 You can choose to view a relevant blog post or web site using a browser view if you wish. 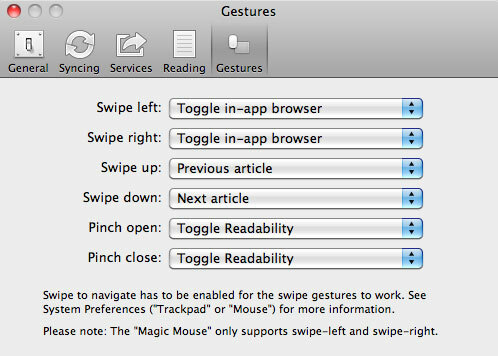 Finally, one of the preference panes allows you to take full advantage of gestures on a trackpad or Magic Mouse. I have not completely configured that as yet. Reeder for OS X is still in beta. You can download it from made@gloria. It is free of course. I have had no issues with this beta version at all. PS. I apologise to my readers on the Windows or Linux platforms. I am a little Mac centric just now but I must admit that 99% of my workshops are conducted using a Windows environment. 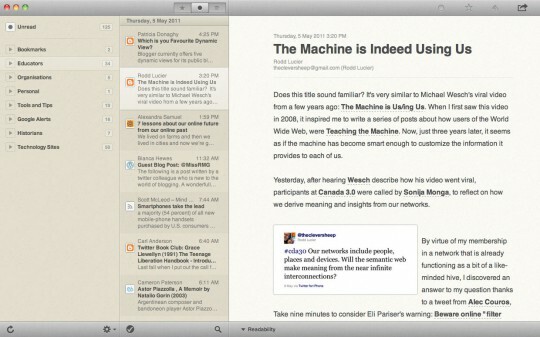 I use Reeder on my iPad and totally agree with you that it is worth spending the money on. Nowadays I do most my reading on my iPad so Reeder makes life easier. Whereas Flipboard is good for links shared on Twitter. Thanks for sharing. Am presently using Google Reader straight but Reeder does seem to be a faster yet more elegant way to skim headlines and read news.